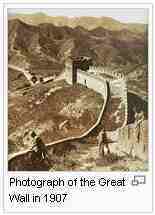 Several walls, referred to as the Great Wall of China, were built since the 5th century BC. 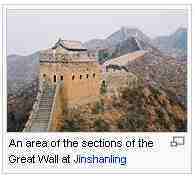 The most famous is the wall built between 220 BC and 200 BC by the first Emperor of China, Qin Shi Huang; little of it remains; it was much farther north than the current wall, which was built during the Ming Dynasty. The Great Wall is the world's longest human-made structure, stretching over approximately 6,400 km (4,000 miles) from Shanhaiguan in the east to Lop Nur in the west, along an arc that roughly delineates the southern edge of Inner Mongolia, but stretches to over 6,700 km (4,160 miles) in total. It is also the largest human-made structure ever built in terms of surface area and mass. 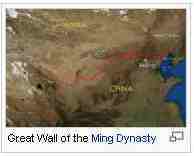 At its peak the Ming Wall was guarded by more than one million men. 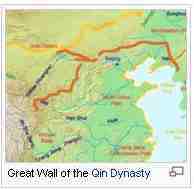 It has been estimated that somewhere in the range of 2 to 3 million Chinese died as part of the centuries-long project of building the wall. This page was retrieved and condensed from (http://en.wikipedia.org/wiki/Great_Wall_of_China) see Wikipedia, the free encyclopedia, November 2007. 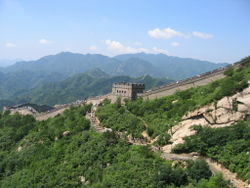 At the "North Pass" of Juyongguan pass, known as the Badaling, you can see the wall climbing up and down large hills as far as the eye can see without much effort.